President, The Sickle Cell Society, Ireland (SCSI) and Sickle Cell Awareness Initiative Nigerian-Ireland, Mrs. Esther Pepple Onolememen on Friday revealed that not fewer than 40 million Nigerians are currently been affected by Sickle Cell Anaemia, saying it may become an epidemic if urgent action is not taking by Federal government. 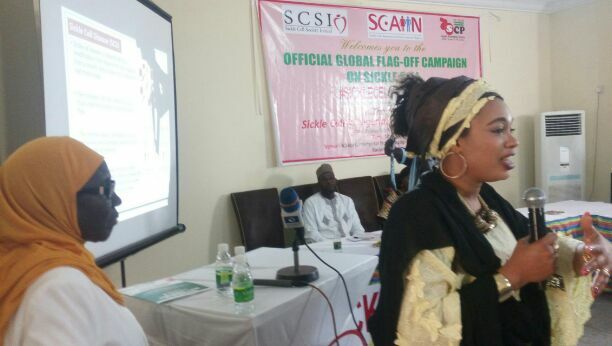 This was coming as Founder and Coordinator of a Kaduna-based non-governmental organizatiin, Sickle Cell Patients Health Promotion Centre (SCPHPC), Hajia Badiya Magaji Inuwa, hinted that she’s currently giving care to about 3,000 SCA patients in Kaduna without any assistance from government. She stated that she founded the NGO some years back after losing one of her two children who are living with SCA died and concern for other parents and patients who may not know where to access care. Speaking during the official global flag-off awareness campaign on sickle cell in Kaduna State to help members of the public, Mrs Onolememem, who is coincidentally also having two children living with the scourge further added that about 300,000 live births are being added annually. According to her, over 25 percent of adults in Nigeria have the traits of sickle Cell, while Infant Mortality rate is about 8 percent, and annual growth rate at 3.2 percent. She said, “the percentage of people living with sickle cell in Nigeria is high, if you look at it statistically is high and if you project the next ten years more than half of Nigeria’s population will be affected. “If 40 million Nigerians are affected by sickle Cell as at now that we about 170 million, that’s huge and if you look at the number of birth each year of carriers almost 300,000, what does that tell you? “Meaning in the next three‎ years alone we would have about 900,000 birth of carriers adding to the 40 million, you find that sickle cell will gradually become an epidemic in Nigeria if there are no response”, she added. The only way to reduce the menace according to her is for everyone; government, organisations, individuals and the community to come together ‎and understand that sickle matter is a campaign that advocates for improved healthcare, improved research, improved family support, and improved education and awareness. Speaking with newsmen, Hajiya Badiya Inuwa, restated that the best and sure antidote to sickle cell is awareness, quickly appealed to governments at all levels to‎ invest in awareness and research that will help the public to understand the cause of sickle cell and start screening at birth so young Nigerians will know their genotype before going into any relationship that can lead to marriage. “Research and findings have shown that the antidote to sickle cell anaemia is not in the medical laboratories, but it is in the simple education and enlightenment of our people to do the right thing before marriage. She expressed disappointment over the way the people are turning deaf ear to this simple solution that inadvertently saves the future of their children on the pretense of ‎’love’. “I do not see love in any affair that knowingly or carelessly produces children sentenced to a life of suffering. Such relationships are built on ignorance, greed and selfishness.” She ‎said.